Having Broken Door or Frame in Surrey BC? Broken door, damaged door frame, and door locks are something everybody encounter once in a while. This is because every household or property has a door and that door might need a proper fix every now and then. 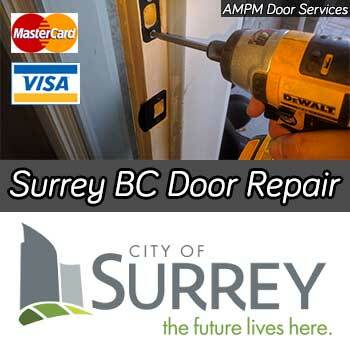 If you are in Surrey and need an 24 hour emergency door repair service, you need not look any further as we are a company that is willing to provide round the clock door repair services in Surrey BC to help our customers sort all door related issues. We are a local door repair company that believes in providing all kinds of door related services. If you have a residential door that needs some fixing, we are willing to help. We can not only change the doors of your property but we can also work to make sure that we do all types of other repairs for doors as well such as paint jobs, lock changes and more. If a residential door is damaged, we are just a call away as we have all the fixes for doors that you might need. Moreover, we also fix commercial doors. We do paint jobs and fix broken and damaged commercial grade steel and metal doors. Our main aim is to fix commercial properties for any damages that there might be. Therefore, we fix commercial doors, namely doors of malls, commercial properties, and others. If your sliding glass door has become somewhat outdated and needs a fix, we are willing to help. Our patio door repair services make sure that your sliding door gets sorted just as the way you want. We fix it for broken rollers, or any other fix that might be necessary such as cracked or broken tracks. There is a lot that goes wrong with sliding doors and 24hr Door Repair is here to fix all related problems for our customers.